Fund My Mutual Fund: Nouriel Robini: "Told You So"
Nouriel Robini: "Told You So"
The New York Times has a big write up on Roubini below - I've included the photo for added spook. What I find ironic about economists is despite being called the dismal science they really are no different than normal humans - they drink Kool Aid in huge quantities and generally fall into the "way too optimistic camp". The most optimistic get permanent rotational guest appearances on CNBC. So when a "truth teller" comes along, he/she/I is seen as a doomsdayer ;) I was also sort of smirking at the "economist on economist" sparring within this article - heck, Roubini could be wrong on every prediction from here on out on this crisis and he'll be 99% more accurate than those who lounged in the Kool Aid pool in 2005/2006. But since he does not rely on "mathematical models" in a religious manner he could be looked down upon. Those same models that even last fall, winter, and to this day have people denying there is anything wrong with the economy. Laughable. So read on to hear about Dr. DOOM! The audience seemed skeptical, even dismissive. As Roubini stepped down from the lectern after his talk, the moderator of the event quipped, “I think perhaps we will need a stiff drink after that.” People laughed — and not without reason. At the time, unemployment and inflation remained low, and the economy, while weak, was still growing, despite rising oil prices and a softening housing market. But Roubini was soon vindicated. In the year that followed, subprime lenders began entering bankruptcy, hedge funds began going under and the stock market plunged. There was declining employment, a deteriorating dollar, ever-increasing evidence of a huge housing bust and a growing air of panic in financial markets as the credit crisis deepened. By late summer, the Federal Reserve was rushing to the rescue, making the first of many unorthodox interventions in the economy, including cutting the lending rate by 50 basis points and buying up tens of billions of dollars in mortgage-backed securities. “I’m not a pessimist by nature,” he insisted. “I’m not someone who sees things in a bleak way.” Just looking at him, I found the assertion hard to credit. 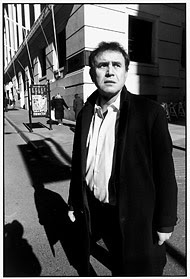 With a dour manner and an aura of gloom about him, Roubini gives the impression of being permanently pained, as if the burden of what he knows is almost too much for him to bear. He rarely smiles, and when he does, his face, topped by an unruly mop of brown hair, contorts into something more closely resembling a grimace. Though he continues to issue colorful doomsday prophecies of a decidedly nonmainstream sort — especially on his popular and polemical blog, where he offers visions of “equity market slaughter” and the “Coming Systemic Bust of the U.S. Banking System” — the mainstream economic establishment appears to be moving closer, however fitfully, to his way of seeing things. The ’90s were an eventful time for an international economist like Roubini. Throughout the decade, one emerging economy after another was beset by crisis, beginning with Mexico’s in 1994. Panics swept Asia, including Thailand, Indonesia and Korea, in 1997 and 1998. The economies of Brazil and Russia imploded in 1998. Argentina’s followed in 2000. Roubini began studying these countries and soon identified what he saw as their common weaknesses. On the eve of the crises that befell them, he noticed, most had huge current-account deficits (meaning, basically, that they spent far more than they made), and they typically financed these deficits by borrowing from abroad in ways that exposed them to the national equivalent of bank runs. Most of these countries also had poorly regulated banking systems plagued by excessive borrowing and reckless lending. Corporate governance was often weak, with cronyism in abundance. Does that sound familiar? Of course it could never happen here - we're the United States of Subprime - we are impervious!